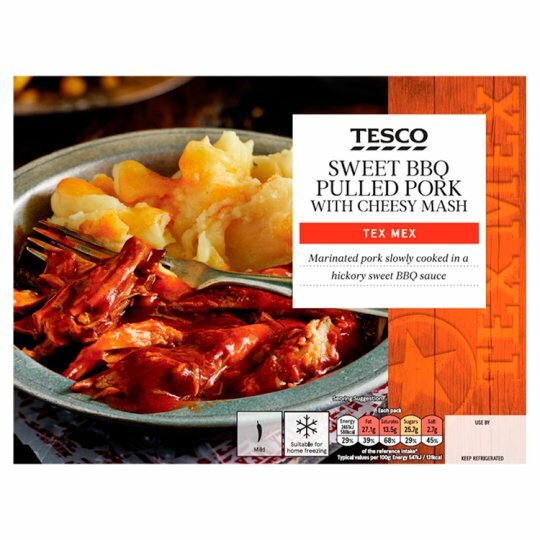 Marinated pulled pork in a barbecue sauce with mashed potato topped with cheese and paprika. Marinated pork slowly cooked in a hickory sweet BBQ sauce. Our chefs have been inspired by the flavours of Southern America and Mexico to create this collection of fusion Tex Mex favourites. Mashed Potato (49%), Pork Shoulder (15%), Tomato, Water, Cheddar Cheese (Milk), Muscovado Sugar, Tomato Purée, Sugar, Honey, Cornflour, Red Wine Vinegar, Spirit Vinegar, Tomato Paste, Rapeseed Oil, Garlic Purée, Salt, Pork Gelatine, Fructose, Demerara Sugar, Caramelised Sugar, Molasses, White Wine Vinegar, Mustard Flour, Glucose Syrup, Black Pepper, Onion Powder, Onion Purée, Tamarind Paste, Paprika, Mustard Bran, Smoked Salt, Smoked Paprika, Acidity Regulator (Acetic Acid, Malic Acid), Sea Salt, Ginger Purée, Clove, Garlic Extract, Allspice, Mustard Powder, White Pepper, Turmeric Powder, Cumin Powder, Cayenne Pepper, Pimento Powder, Clove Powder, Garlic Powder. Mashed Potato contains: Potato, Skimmed Milk, Milk, Butter (Milk), Salt, White Pepper. Instructions: From Chilled: 190°C / Fan 170°C / Gas 5 20-25mins. Place on a baking tray in the centre of a pre-heated oven and heat for 20-25 minutes. Leave to stand for 1 minute after heating. Stir before serving. Instructions: From Frozen: 190°C / Fan 170°C / Gas 5 35-40mins. Place on a baking tray in the centre of a pre-heated oven for 35-40 minutes. Leave to stand for 1 minute after heating. Stir before serving. Heat on full power for 3 minutes (800W)/ 2 minutes 30 seconds (900W). Peel back film lid, stir, re-cover and heat for a further 2 minutes 30 seconds (800W)/ 2 minutes (900W). Instructions: From frozen: 800W / 900W 10 / 8 mins. Heat on full power for 5 minutes 30 seconds (800W)/ 4 minutes 30 seconds (900W). Peel back film lid, stir, re-cover and heat for a further 4 minutes 30 seconds (800W)/ 3 minutes 30 seconds (900W). Remove outer sleeve and pierce film lid on both compartments several times.